Here I was flying away on the last few repeats of the last round of this doily when disaster struck!! I couldn't believe my eyes - OH NO! Shock, horror: there was one too many rings on one scallop of the previous row! I kept looking at it, hoping to find a solution that wouldn't involve me cutting out the mistake on the row below and struggling to join it back in as an invisible way as possible. But no, there was no avoiding it, I had to cut and re-do. The re-join is not perfect (up close anyway) so I'll have to ask advice on the best way to join in these circumstances and how to deal with the ends that result. Jan Stawasz Doily, tatted in Lizbeth, size 20, écru. 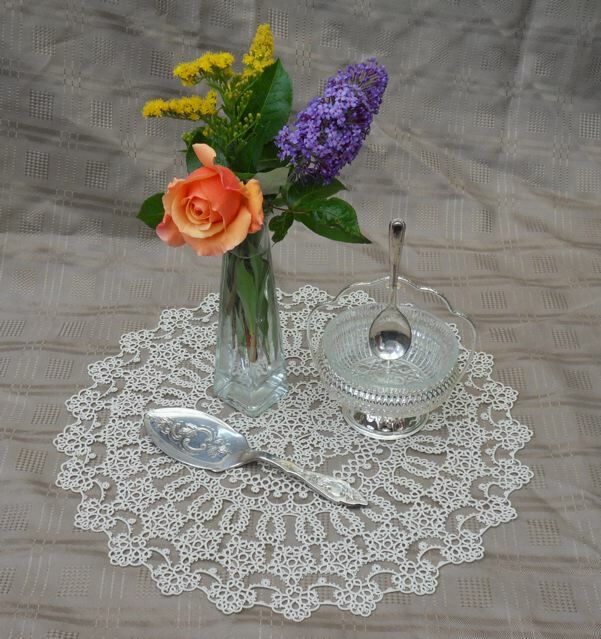 I am delighted with this doily and after two Jan Stawasz projects, remain a fan of his designs. When I started tatting again just a year or two ago, I didn't think I had it in me to tackle larger projects like this but I have really enjoyed making my two doilies... and I don't think this one will be the last either! Thanks for all of your comments of support whilst the doily was in progress. Lovely work! What size thread did you use? Another absolute STUNNER! Gorgeous, gorgeous! Congrats. 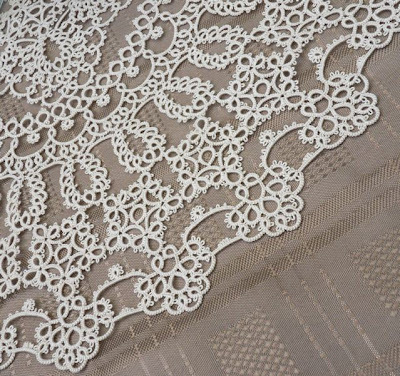 It is beautiful lace work, a wonderful achievement. Congratulations on a job well done. As Fox has already said, it is "stunning." Beautiful! 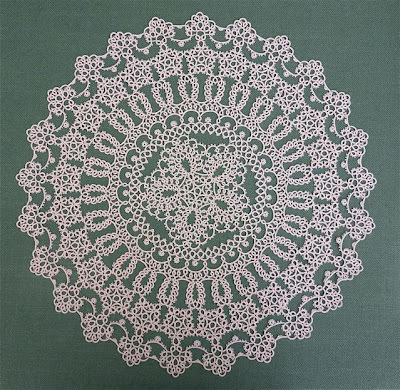 Jan's doilies are intriguing, and you've done a fabulous job! Incredibly beautiful!!! Your work is more than lovely...I can see why you are a fan of Jan's designs!!! These are some of the prettiest doiley designs I've ever seen...I simply love both the doilies you have done, they are exquisitely beautiful!!! 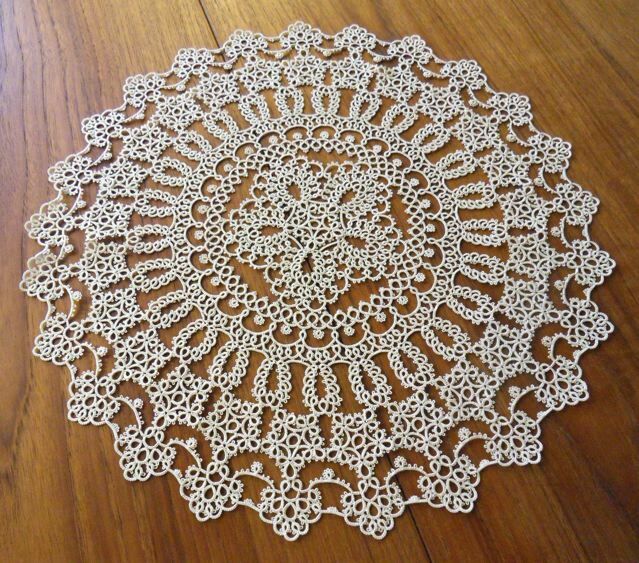 Great, beautiful looking doily left me drooling over it. Very nice work. Absolutely breathtaking! Honestly, your photos literally took my breath away. Outstanding work! Frivole, your tatting is an inspiration! Very beautiful! Jan Stawasz's patterns are only available from his book which is now very hard to find. But I hear rumours that he may be about to have it reprinted... are they true? I hope it's true — I really want to tat his doilies now! Hi Grace, hope you see my reply - if you go over to his website, he says that his first book is being re-printed at the moment and that he is bringing out a second book. This is very good news to me! Hi Frivole, Amazing work! You must have a ton of patience! What size thread did you use? Hello, I used size 20 Lizbeth (my favourite for most things). Thanks for stopping by! Your work is lovely and the mistake is undetectable. I have taught tatting since the 70's and until today when I saw videos on YouTube, I was unaware that there were other ways to hold the shuttle to make the knot. I use the method you do and find it to be very efficient for speed. I understand your reluctance to make a large piece. I am content to do edgings and doilies myself. I cannot imagine how quickly the tatters in the past worked to create bedspreads and tablecloths, or perhaps it just took years to complete. Congratulations on your beautiful work. Thank you for your nice message. I'm not sure tatters in the old days worked necessarily faster than we do... perhaps they were just more prepared to work a long time on large pieces. 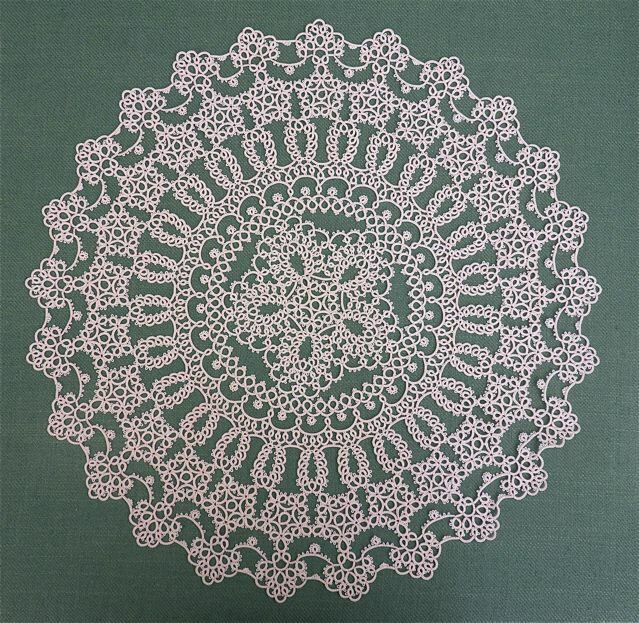 In spite of what I said, I do enjoy tatting more substantial pieces and the doily I'm currently working on is quite a bit bigger than this Jan Stawasz one! One bigger?? What is the doily pattern you are working on? My curious mind wants to know. I am working o. Ben Fikkert 's doily right called "Noel". I started on the last round last year but I have sadly not made much progress since then, mostly due to the fact that I'm not sure the stitch count is right on the last round (it feels tight) and I don't know if I should adjust it or not. It will definitely get finished though! Great pattern. His two books are wonderful. I wanted to say thank you for your "Slip and Slide" You-Tube video! I have wanted to learn to tat for years. (Did not know anyone who could teach it) I just watched your video; and have made my first two inches of knots! I can't wait to do my first picot! Now, practice, practice, practice. Oh, happy day! Plus, I now have your Blog! Hi Forgetmenot, I hope you'll see this message! I'm so glad you found the video helpful and I hope you'll be on your way to lots of tatting enjoyment. I hope you noticed that I'm not currently able to comment on my videos which is frustrating but I can always be reached through here.